Gnome-Pie is a slick and powerful application launcher for Linux. This article is about a program named GNOME-Pie. It is an application launcher made for Linux, which represents the programs in the form of circular discs or pies. They surround a central pie that has the name of the category. These individual applications are called slices. The program is a great eye-candy, but it is also highly productive and fast. Apart from launching applications, it can also be used to perform actions such as Shutdown, or maximizing a window. Let’s go through the complete features of the program. The representation of the programs is fun and very useful. GNOME-Pie has specific keyboard shortcuts for different categories. When launched, the name of the category appears in the center, surrounded by the programs of that category. You can either launch the menu by clicking or by navigating and entering through the keyboard. It appears and dissolves in a beautiful fading-and-spiral action. Alt-Tab: It shows all the programs that are open on your system. As the name suggests, its an alternative for Alt+Tab. Application: This category contains all the major apps, which are the web browser, mail reader, text editor, video player, music player, and the photo viewer. Bookmarks: It contains the main directories of users, like Downloads, Videos, Documents, etc. and the mounted devices. Everything that you see on the left panel of your file manager. Main Menu: It contains the programs and categories as you’d see on your default menu launcher. Categories like Education, Accessories, Development, etc. are available, and so are applications like the web browser and text editor. Multimedia: It provides the controls for the media player of the system. Session: It enables users to Shutdown, Reboot or Logout of their session. Window: It shows window operations namely maximize, minimize, restore, scale, and close. For every category, GNOME-Pie provides configuration options that are almost everything that you need. You can change the keyboard shortcut, the arrangement of the pies, make the menu appear at the center of the display, and some more options. The general settings provided are just like the pie configurations that should be adequate for most users. You can change the size of the pies, make GNOME-Pie start on login (which you probably will need to check), and even change the theme. The themes provided by GNOME-Pie already are of all kinds. You can get a futuristic look or a funky look. Matching themes for some common Linux desktops themes like Adwaita and Numix is provided. Themes matching to the DE of elementary OS and Unity are also included. Installing GNOME-Pie on Linux Mint. For other distributions, the program can be installed by compiling from the source. To find instructions, visit this site. The usage of GNOME-Pie is very simple. Just launch the program after installation and it will appear in the tray with a fancy symbol. 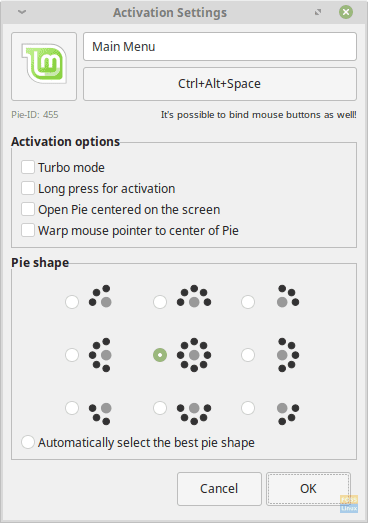 To start it automatically during login, just enable the option in GNOME-Pie’s general settings. GNOME-Pie is an excellent menu launcher which looks great and at the same time is fully functional. Kudos to the developers for including all the tweaks and settings that users will ever need. GNOME-Pie is for those who want something more from their launcher, is powerful, and that also looks groovy. Let us know what you think about the program in the comments below. Manjaro Linux is based on the independently developed Arch operating system. Arch Linux is already known to be an exceptionally fast, powerful, and lightweight distribution. But Arch Linux is typically targeted to geeks who have some Linux background and command-line usage.